Copyright: © 2018 Akman F, et al. This is an open access article distributed under the Creative Commons Attribution License, which permits unrestricted use, distribution, and reproduction in any medium, provided the original work is properly cited. Objectives: The aim of this study is to compute the radiation attenuation parameters such as mass attenuation coefficient, linear attenuation coefficient, half value layer, mean free path, and effective atomic number for some selected chemotherapy drugs such as Lomustine, Cisplatin, Carmustine, and Chlorambucil in the energy range from 1 keV to 100 GeV. Materials and Methods: The mass attenuation coefficients were calculated with the help of WinXCOM program. Using the obtained mass attenuation coefficients, other parameters such as linear attenuation coefficient, half value layer, mean free path, and effective atomic number were derived. Results: It is observed that the variations of these parameters with respect to the photon energy show changes in different energy regions. According to the obtained results, Cisplatin has the highest mass attenuation coefficient, linear attenuation coefficient and effective atomic number results among the selected chemotherapy drugs. Moreover, Chlorambucil has the highest half value layer and mean free path results among the selected chemotherapy drugs. Conclusion: The results of this study are useful for applied science fields such as radiation physics, pharmacology, and medical physics. These results may be useful when the selected chemotherapy drugs are used together with radiology. Ionizing radiation is frequently used in medicine for diagnostic and therapeutic. Therefore, the accurate values of attenuation parameters for this type radiation are very important. Lomustine, Cisplatin, Carmustine, and Chlorambucil are very well-known chemotherapeutic drugs. These chemotherapy drugs are class of alkylating agents which are a class of antineoplastic or anticancer drugs. The drugs in this class inhibit the transcription of DNA into RNA and thus stop the protein synthesis . Carmustine and Lomustine is utilized alone or combined with other drugs to treat various types’ cancer such as testicular, pancreatic, ovarian, lymphoma and brain. Chlorambucil is usually preferred in the treatment of chronic lymphocytic leukemia, Hodgkin’s and non-Hodgkin’s lymphomas . Cisplatin is usually chosen because of its strong antitumor activity, but its side effects contain renal toxicity, nausea and vomiting. Cisplatin is generally preferred in the treatment of chemotherapy for lung, ovarian, breast, and brain cancers . Furthermore, radioactive Cisplatin with low doses and short half-life is used in such treatment . The information on radiation attenuation parameters may be useful when these drugs are used together with radiology. The parameters such as mass attenuation coefficient, linear attenuation coefficient, half value layer, tenth value layer, mean free path, effective atomic number, and effective electron density are quantities to provide information about the radiation attenuation in case of interaction of matter with radiation. These parameters are important for many applied sciences such as health physics, engineering, radiation physics, and space research. There are many scientific studies carried out for these parameters using the different type matters in the literature [5-15]. 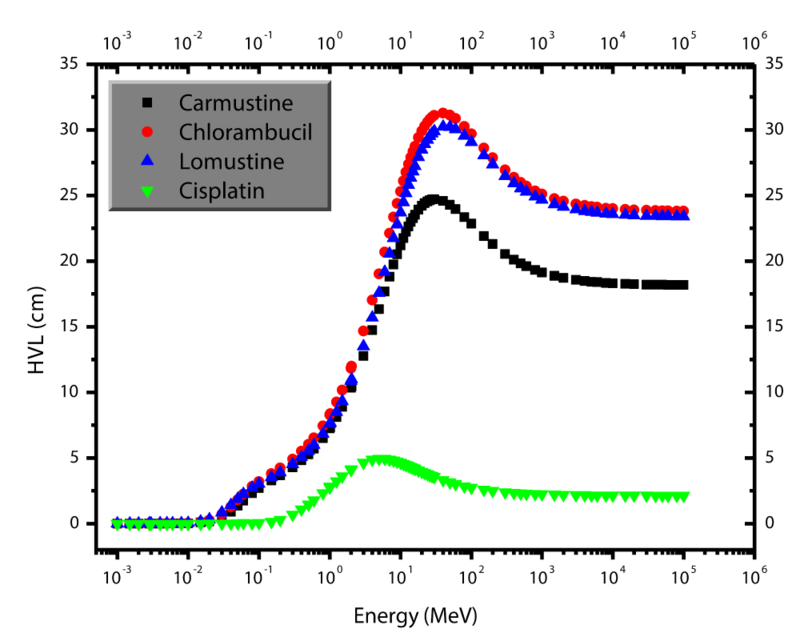 The aim of this study is to investigate the radiation attenuation parameters such as mass attenuation coefficient, linear attenuation coefficient, half value layer, mean free path, and effective atomic number of commonly used in chemotherapeutic drugs such as Lomustine, Cisplatin, Carmustine, and Chlorambucil. The calculations were carried out with the aid of the WinXCOM program  in the energy range from 1 keV to 100 GeV. The obtained theoretical results are shown graphically and interpreted for different interaction processes, namely, photoelectric absorption, Compton scattering, and pair production. In the equation, Ai implies the atomic weight, Zi represents the atomic number and fi implies the fractional abundance of the related element in the matter. The chemical formulas, physical densities and molecular weights of Camustine, Chlorambucil, Lomustine, and Cisplatin drugs are given in Table 1. The mass attenuation coefficients, linear attenuation coefficients, half value layers, mean free paths, and effective atomic numbers of the selected drugs were computed with the help of the information given in Table 1. The determined mass attenuation coefficients by the WinXCOM program are graphically demonstrated in Figure 1. The linear attenuation coefficient and effective atomic number results, which are directly dependent on the mass attenuation coefficient, against energy are presented in Figures 2-3, respectively. As clearly seen from Figures 1-3, it is observed that the results of these parameters show different changes in different energy regions. For this reason, the interpretation of these figures should be made according to the different interaction processes, namely, they should be interpreted with photoelectric absorption, Compton scattering and pair production processes. In the low energy region, it is observed that the mass attenuation coefficient, linear attenuation coefficient and effective atomic number values decrease sharply and exponentially with respect to the energy. The reason for this observation is the photoelectric absorption which is predominant interaction process in the low energy region. The proportions between photoelectric absorption and energy, and atomic number are 1/E3.5 and Z4-5, respectively. In the medium energy region, it is seen that the variations in these parameters against the energy are slighter, or even almost constant. The dominant interaction in this region is Compton scattering and it is inversely proportional to energy (E), and directly proportional to the atomic number (Z). 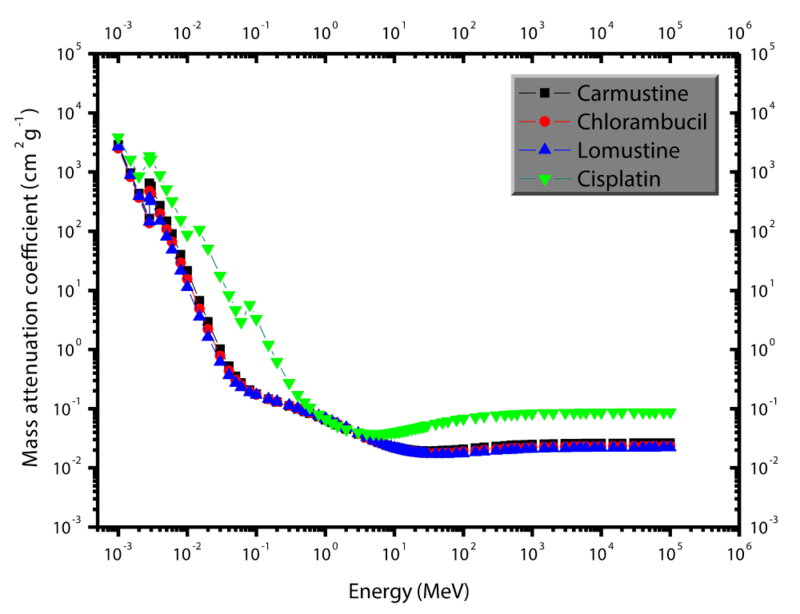 Figure 1: The graph of mass attenuation coefficient versus photon energy for the selected chemotherapy drugs. 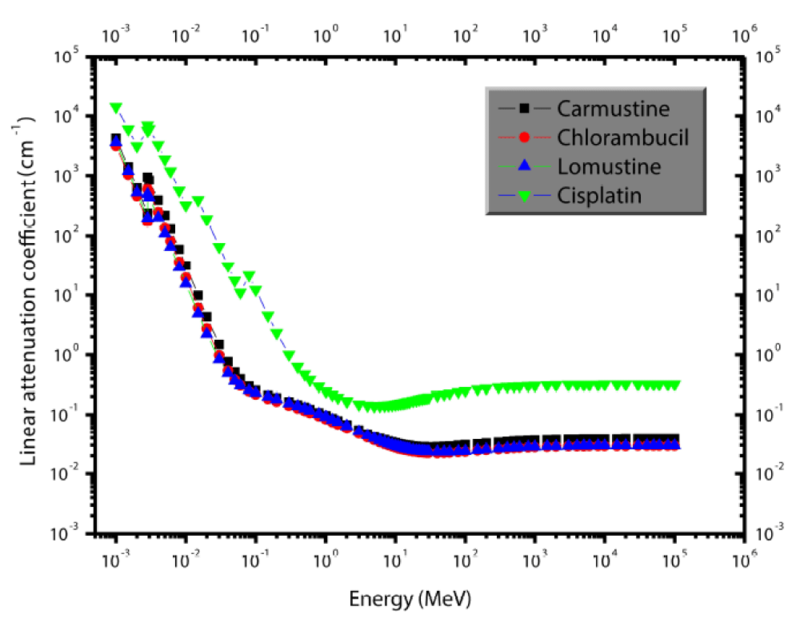 Figure 2: The graph of linear attenuation coefficient versus photon energy for the selected chemotherapy drugs. Figure 3: The variation of effective atomic number against photon energy for the selected chemotherapy drugs. It is observed that these parameters increase again in the high energy region. The dominant interaction in this region is pair production which is directly proportional with the energy and atomic number as E and Z2, respectively. Similar observations have been reported by Kavaz et al. who calculated the some attenuation parameters such as energy absorption buildup factor, exposure buildup factor, effective atomic number and effective electron density for some selected chemotherapy drugs. 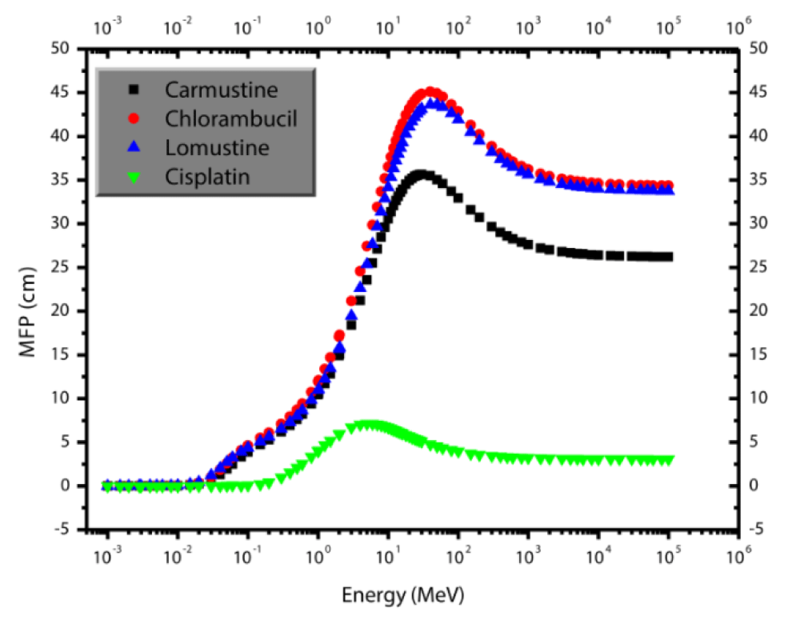 According to the Figures 1-2, Cisplatin has the highest mass and linear attenuation coefficients among the selected drug samples due to the presence of the platinum element. This element has the largest atomic number in all selected drug samples. We can say that the mass attenuation coefficient increases with increasing atomic number. Moreover, the linear attenuation coefficient increases with increasing density (Table 1). The half value layer and mean free path results of selected chemotherapy drugs, derived using the linear attenuation coefficients, are illustrated in Figures 4-5, respectively. In the low energy region, the half value layers and mean free paths are almost constant and then they increase sharply with respect to the energy. In the medium energy region, they have the highest values. In the last energy region, namely, in the high energy region, the half value layer and mean free path results against energy decrease exponentially. So, the exact opposite observations in mass and linear attenuation coefficients is observed in the half value layers and mean free paths. The reason for these observations that as can be easily seen from equations 2-3, the linear attenuation coefficient is inversely proportional to half value layer and mean free path. The highest half value layer and mean free path values were found for Chlorambucil drug, while the lowest half value layer and mean free path values were found for Cisplatin drug among the selected chemotherapy drugs. This means that a thinner Cisplatin drug will be sufficient to absorb any given energy, while a thicker Chlorambucil drug will be needed. Figure 4: The change of half value layer versus photon energy for the selected chemotherapy drugs. Figure 5: The change of mean free path versus photon energy for the selected chemotherapy drugs. 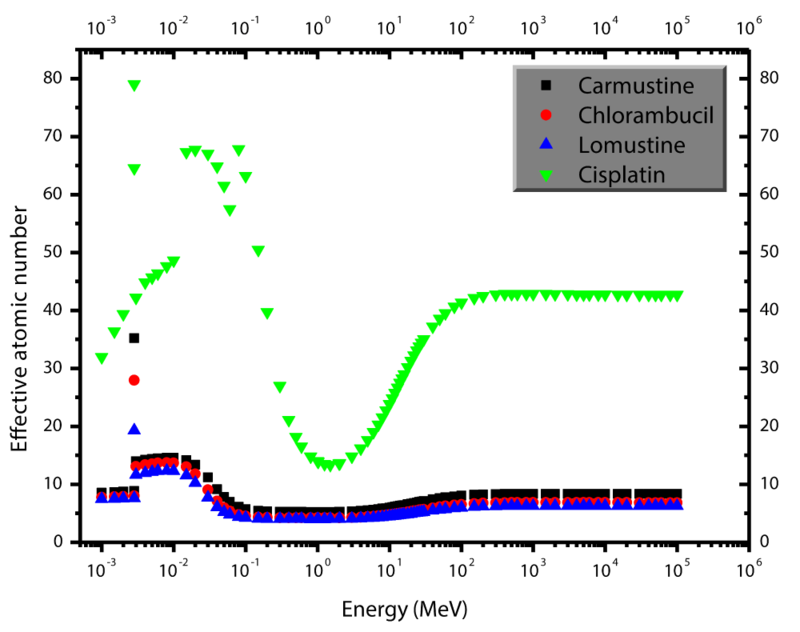 In the present research, the some radiation attenuation parameters such as mass attenuation coefficient, linear attenuation coefficient, half value layer, mean free path, and effective atomic number of selected chemotherapy drugs such as Carmustine, Chlorambucil, Lomustine, and Cisplatin were investigated in wide energy region. It was observed that these parameter change depending on different interaction processes. The highest values of mass attenuation coefficient, linear attenuation coefficient, and effective atomic number were observed in the low energy region and the highest values of half value layer, and mean free path were observed in the medium energy region. Cisplatin is the chemotherapy drug having the best radiation attenuation characteristics among the selected drug samples. The results of this study are useful for applied science fields such as radiation physics, pharmacology, and medical physics. Besides, the presented results may be useful when the selected chemotherapy drugs are used together with radiology. National Institutes of Health, 2012.